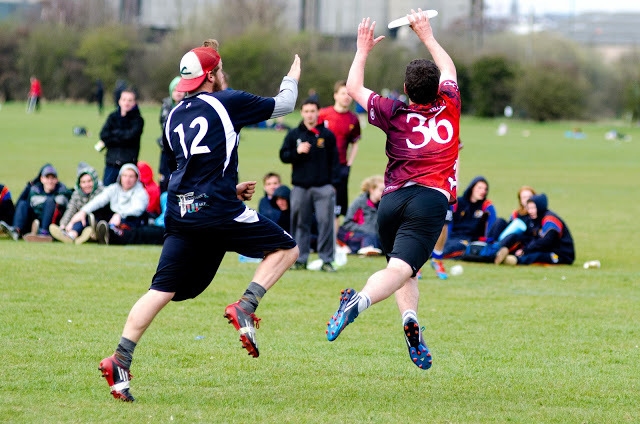 Coming up this weekend is the biggest event of the early university ultimate calendar: Men’s Indoor Nationals. Finally teams get a shot at those all important BUCS points, and a chance to prove UK-wide dominance at Ultimate played on a slightly smaller field and under a roof. This year is certainly a lot more special than most. With the all-new regional set-up and an expansion of the capacity from 16 to 20, a lot of different teams have made it, and there’s a lot of uncertainty in the air as to who everyone is and who is going to come home with medals. Of course, having 20 teams also gives the potential for a team to be the lowest ever finisher at Div 1 Nationals. However, with five Scottish teams and seven (yes, seven) qualifying from the old Midlands region, there’s going to be a familiar flavour to proceedings, even in an interesting year like this. It’s important to remember as well that this tournament is played in the infamous Alan Higgs centre in Coventry. Which means that teams will be playing on 3G, some of them for the first time (only two of the seven regions actually play on 3G to qualify). Considering this venue has played host to two GB U23 trials so far, and will play host to mixed trials the week after, these boys are going to have to step their game up to impress the staff at the venue. So who is going to be taking home the medals (along with the complimentary rubber crumb) this weekend? After a great year in 2013/14 (including 4th place at Indoor Nationals), Leeds have managed to retain lots of the talent that got them there (Claire Taylor, Katie Lear, Rachel Douglas, Rachel Finch and Captain Alice Beeching) and have developed lots of players, thanks in part to their connection with local women’s team LeedsLeedsLeeds. To top it off they have picked up Aussie U23 Cath O’Neill, so keep your eyes out for big bids. Hannah Newton gives us her outlook on the Scottish region for BUCS Women’s Indoor Regionals. This weekend, the best of Scotland’s (*UK) university ultimate ladies will venture to Aberdeen (*except the ones that live there who will just roll right out of bed and along the street to the ASV) to fight for nationals qualification and for victory. This year there will be BUCS points on offer at Nationals for the first time driving up the stakes for qualification (*Travelodges vs. church hall floors). An epic 5 teams will qualify for the mighty journey south to remind the rest of the UK that Scotland is awesome at Uni Ultimate (*indoors). Emily “Will she ever graduate?” McGrath (aka Young Money) will be offering some pearls of wisdom, unsolicited opinion and general meandering thoughts as I attempt to describe and rate the chances of the different teams. As Women’s Indoor Regionals approach, Lauren Bryant summarises the goals and aims discussed at the recent London Women’s University Ultimate meeting. The Club and University representatives who gathered for the recent meeting. Last year saw Scotland dominate proceedings open, with every team attending a nationals event (div 1, div 2, indoors and outdoors) finishing in the top 8. This performance helped them get the 4th division 1 spot in front of the Midlands; something that Glasgow will be very glad of having scrapped for the final qualification spot at regionals. Edinburgh vs Dundee at Scottish Regionals this year. Photo courtesy of LightBox St Andrews. The usual combination of graduating players and development since last year always makes prediction extremely tough, but all of the regional champions will be hoping to make a run at the nationals trophy. Dundee once again won in Scotland and will be confident they can dominate their English competition. The athleticism that runs throughout their team is seriously impressive, with Benji Heywood describing some of their defensive work as ‘ridiculous’. Heriott-Watt were predicted as the dark horses to make Div 1 in Scotland by many and successfully lived up to those expectations. Div 1 outdoors is new territory for them but they will be confident that their rapidly developing team can make an impact. Close behind them Edinburgh will look to maintain their impressive reputation. Built up by an appearance in the final last year, the loss of some key players has left them looking unlikely to repeat a finals berth but they will still hope to make the top half. Taking the final Div 1 spot from Scotland are Glasgow. A strong showing indoors will have built confidence, but after under-performing at outdoor regionals they will be hoping as they did indoors to place higher at the national competition. Northern Champions Durham comfortably saw off the usual Northern heavyweights Manchester in their regional final and I expect them to make the top 8 with ease. Having upset the usual state of affairs in the North, they’ll take a lot of confidence into Nationals and having with a handy ability to win the right games at the right time throughout this season so far, they are one of my tips to make the semi-finals. Manchester however will want to correct what they will see as an aberration in not winning regionals. Despite still possessing some top players, everyone is wondering if they have the squad depth to compete with the best in the country. York are another team whose progression to Div 1 status has been rapid after failing to qualify last year for Division 2. Since then they have worked hard and developed into a cohesive unit – no one was surprised when they secured 3rd place at Northern regionals. In the Midlands traditional University powerhouse Warwick sprung a surprise victory and regained their position at the top after a couple of years in the (relative) wilderness. Captain Sam Hawkins masterminded victory in a tough region, leading a squad with no big stars to a well deserved regional title. Warwick will want to add their name to a trophy they have won multiple times before, however they could be held back by several absentees from their regional squad. Cambridge won Indoors and will fully believe they can repeat the trick outdoors. Their chances are harmed by having only half of ‘those two Americans’ (Justin Norden and Ben Funk) involved as Funk is reportedly injured. This gives even more importance to the depth of their team, and opposition will be hoping to pressure squad players into errors in order to beat them. Birmingham have an impressive recent track record with victories at UMIN, UMON, as well as 3rd place finishes at UOON 2014 and UOIN 2013 and 2014. Despite this they only managed 3rd place at regionals, and needed a second attempt to beat Nottingham to qualify. Having done so they will now be looking to add more medals to their impressive collection. In the West, Bristol surprised some to take the regional title, overcoming a star-studded Bath team as well as any doubts about their ability to cope with poor conditions. Josh Kyme is the leader of the team, and along with Joe Brown runs the handler set and with a wealth of downfield options in the Bristol cutters, their job is only made easier. Bristol beat favourites Bath to the top spot at regionals who have on their roster both GB and Jen players including Alex Brooks (Jen captain, previously GBU23 Captain and GB Open), Piers Nicholas (GB u20), Michael Guise (GB u20) and Andy Watt (Jen). Last year they won regionals but failed to break the top 8 at nationals and will surely hope to improve this time round. Cardiff make up the qualifiers from the West and they will be delighted with a regionals performance which saw them outperform several strong sides to earn a Div 1 spot, winning the game to go against arch-rivals Exeter. With their own star player in Kei Matsumoto leading a team full of developing freshers it will be exciting to see how they manage the pressure of a top level national competition. Lastly onto the South East, where Sussex put on a huge demonstration of strength with their 1st and 2nd team proving stronger than anything the rest of the region could muster. This pretty extraordinary statement indicates the depth of their program and suggests they’ll have strong hopes for nationals. The first team will make their usual push for the top four with eyes set firmly on the BUCS trophy. The second team will be hoping to improve on previous showings at Div 1 events (coming last at both Indoors this year and Outdoors last year). Imperial have established themselves as the best of the rest from the South East, and no wonder with big names such as Stephan Rossbauer (Clapham), James Threadgill (Cambridge mixed), David Pryce (Fire) and Phil Sandwell (Ka-Pow). They will have aspirations of a top 8 spot at least. Three of these four are regional champions and I’m backing them to carry the habit of winning into this tournament and make the most of their strong seedings. Birmingham under-performed at regionals but have a talented squad who are used to winning and could upset their seeding from the start of the weekend in a big way. Good luck to all teams competing at this year’s BUCS Nationals – keep an eye out for results and tournament review on The Showgame! The Grapevine – ultimate links and news from around the globe. Understanding Ultimate gets literary in an interesting post that meditates on the relationship between artistic creativity and sport, and argues convincingly for the benefits of self imposed constraints in ultimate training. Take a moment to fill in this feedback form for Nationals and xEUCF if you haven’t already! The commercialisation of US ultimate continues as Keith Raynor argues for an aggressive branding of College teams. A storm is brewing in European ultimate and its set to break out at Bordeaux. Keep an eye out for our xEUCF previews early next week! – JCK @ tSG. 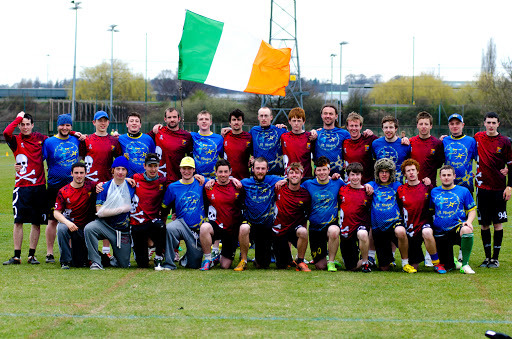 University Nationals Review: A Gaelic Affair. David Pryce reviews an exciting weekend at University Open Nationals in Nottingham. Last week I previewed this event and made a tentative attempt at predicting the outcomes. Yet again the University teams gave us some great action but most of all some surprising results. The full version of these can be found here. Division 1 was very hotly contested from the start where my predicted pool of ‘death’ befitted this title with a three way tie. Early on Sussex beat Edinburgh then Sussex would get beaten by Manchester who would lose to Edinburgh. Manchester (finishing 4th) came out on top, giving Sussex and Edinburgh the crossovers. They managed to power through to quarters where sadly Sussex could not pass Cork and would have to be content with 5th. In the other pools Sheffield battled their way into top 8 but couldn’t quite hold onto their momentum for Sunday finishing 8th. Three teams of pool D managed to get into top 8 places and Birmingham eventually beat Manchester to take 3rd. The final was between Edinburgh and Cork, this turned out to be a one sided affair where Cork only conceded a handful of points. This was not for Edinburgh trying with some great plays on both ends of the field. However, everyone will agree that the boys from Munster were out and out the best team there this weekend and congratulations to them, taking the UK University Nationals title. Only one SE team (Imperial, finishing 3rd) made it into top 8. The final was in fact between Nottingham and Limerick. Both teams had looked strong throughout Saturday. To get themselves there they had to battle somewhat harder against the likes of Warwick and Imperial but deserved their finalist positions. The game itself was still going on well after any other game had ended with one of the last points lasting a good 20 minutes. Calls were made, disputed and discussed with eventual resolution the score was held at 6-6. Then Nottingham powered through to score two on the trot and take the title. The Alumni Cup was also running alongside and after a day and a half of play Bangor and defending champions Leeds were in the final. Leeds could not quite hold onto that title and Bangor are now the best Alumni team in the country. Did you play university ultimate and want to challenge them? Well make sure to enter next year! With two Irish teams doing well, including Limerick who actually came 4th at their ‘regional’, one question was heard all around the tournament: should the Irish region get another slot? Well this would mean one less slot for another region or a bigger tournament. We shall have to wait and see what the UKU does. I for one saw the strength of both these teams and was very impressed, the work done by the IFDA to bring through juniors and create the ultimate hotbeds around Cork and Dublin has clearly paid off. Regardless, Irish university ultimate have thrown down a gauntlet this year – will the mainland teams be able to step up to the challenge? Women’s and Alumni will be covered by the end of the week. Any suggestions for pieces? Got some cool photos? Submit them to showgameblog@gmail.com. Also follow us on Twitter and FB.